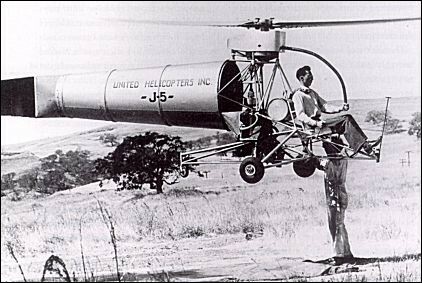 To counteract torque this two-bladed-rotor experimental helicopter used not a conventional tail rotor but a jet thrust system. The latter consisted of a fan blower placed just behind the engine with a 'stove pipe' tail forward. Air was thus forced under pressure through the hollow fuselage into a tail orifice where vanes directed the jet thrust laterally. Main rotor torque was effectively overcome, but this torque compensation system's power requirements proved markedly excessive at speeds greater than 64km/h. Single-seat experimental helicopter with open frame front mounting pilot and engine and metal cone tail with jet thrust duct. One built.